Friday, an incredible five million people turned out to witness the world champion Chicago Cubs victory parade and subsequent rally. The parade began at Wrigley Field (on Chicago's North Side), continued through downtown Chicago and culminated with a mega celebration in the city’s Grant Park. An iFolloSports.com reader provides this original photo Cubs President of Baseball Operations Theo Epstein hoisting the Commissioner’s Trophy. 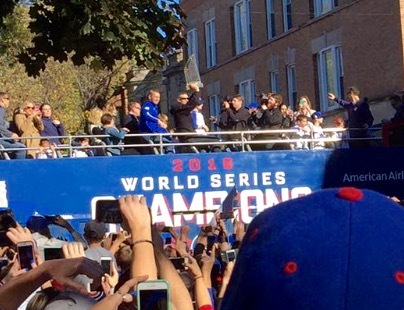 This shot occurred while the reader was standing at the intersection of Addison Street and Wilton Avenue (one block east of Wrigley), shortly after the parade began.